Paula Pryke runs a successful flower business which has a reputation for innovative floral designs. She has been described as “the most brilliant florist in London”. Paula runs a flower school in London and is the author of numerous best-selling books on the subject. 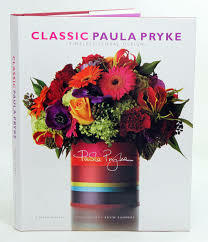 This Classic ‘bible’ to Paula Pryke’s artistic style features more than 80 arrangements and instructions on how to recreate them for the novice. The arrangements are divided into two styles – Classic and Contemporary. 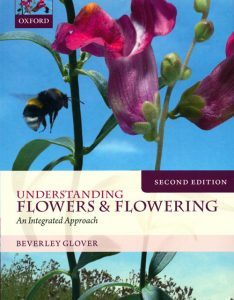 Comprehensive information on techniques is also included together with a gallery of Paula’s favourite flowers, accompanied by advice on how they are best used, plus practical information on care and vase life. Using florist bouquets, cut garden flowers, and even vegetables and other items, Paula’s easy-to-follow step-by-step instructions allows anyone to create ingenious compositions that will add colour and style to the home. RHS Encyclopedia of Planting Combinations: Over 4000 Achievable Planting Schemes. 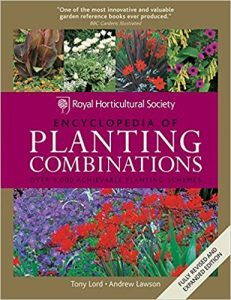 RHS Encyclopedia of Planting Combinations is the essential reference book for anyone wanting to combine plants according to shape, colour, texture, or form. This visionary planting guide features an A-Z of more than 1,000 great garden plants. Each plant is photographed in glorious partnership with one, two or three ideal companions, creating more than 4,000 of the most imaginative and visually effective combinations possible. With a practical introduction and analyses of what makes a successful combination, the authors show how to recreate combinations shown and invent new combinations of your own. 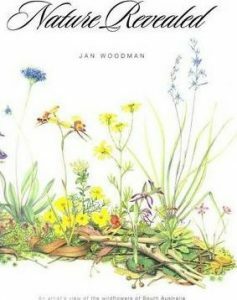 With chapters on bulbs, climbers, perennials, shrubs, trees, roses, and annuals, this book has become the essential reference book for all those who wish to combine plants according to colour, shape, texture, and form in every corner of their gardens. Rhododendrons and azaleas are among the most popular of garden shrubs because of their wonderful variety of colors, textures, shapes, and sizes. Selecting the best species or hybrids for various garden situations can present a real challenge to the gardener. 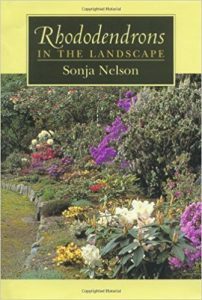 Sonja Nelson, editor of the Journal American Rhododendron Society, offers practical and inspiring guidance on how best to use rhododendrons, starting with a brief explanation of basic design principles that serve as guidelines for creating many different kinds of gardens. She discusses woodland and alpine rock gardens, small gardens, and elements such as island beds, containers, hedges, and water features in which rhododendrons can be effectively used. In addition to suggesting and encouraging the use of suitable companion plants, she provides 19 tables listing species and cultivars most appropriate for specific garden situations. Including many inspiring photographs, the book will enable any gardener or landscaper to display these spectacular plants in harmonious surroundings. Pick of the bunch: the story of twelve treasured flowers. The list of favourite flowers has remained remarkably constant over the centuries. From late-sixteenth, early seventeenth-century Dutch and Flemish flower-pieces we can see what were considered desirable at that time: the rose, iris, carnation and lily, old favourites redolent of the Middle Ages and religious symbolism; the snowdrop, violet and fritillary, `natural’ flowers of the meadow and woodland; and the tulip and hyacinth, fashionable bulbs that could command huge sums. A reader poll conducted a few years ago by the BBC found that the rose is the all-time favourite flower, followed by the lily, the primrose, the iris and the daffodil. 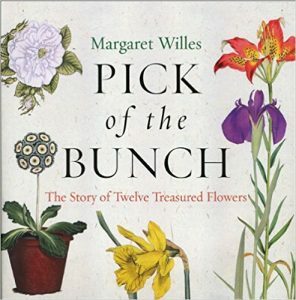 In Pick of the Bunch, Margaret Willes takes twelve of these enduringly popular flowers and looks at their social history, how they got their names, how they arrived in our gardens, how they were bought, acquired and displayed, and who were their devotees. 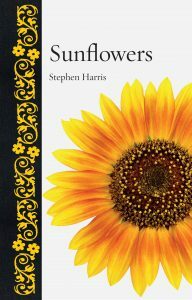 She delves into their symbolic associations in classical and Christian traditions, and the complex language of flowers compiled by the Victorians. She also suggests where they can be seen in all their particular glory today, from the spring-time display of fritillaries in Magdalen College Meadows to the late summer fireworks of the Dahlia Walk at Biddulph Grange. 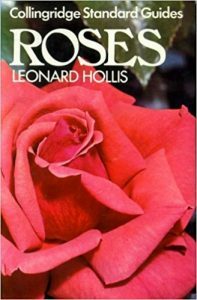 A renowned expert offers a volume of lively information on all types of roses including planting, growing, feeding, pest control, cultural notes, recommendations, and detailed descriptions and provides everything rose gardeners need to know–highlighted by stunning color photographs. Artist/Author: De Vlas, Jacob and Johanna De Vlas. The authors of Illustrated Field Guide to the Flowers of Sri Lanka, Volume 2, Dr. Jacob de Vlas and his wife Johanna de Vlas-de Jong have been visiting Sri Lanka since 1977. 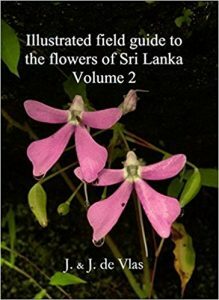 In 2008, they published the Illustrated Field guide to the Flowers of Sri Lanka. 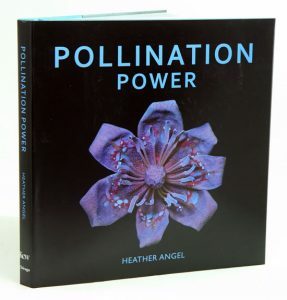 That book contains over 1 000 plant species that can be spotted in easily accessible places all over the country. However, plants that grow in the northern and northeastern regions of Sri Lanka were not included, due to the fact that these areas were closed until 2009.Volume 2 contains 1 060 species of which 963 were not included in the first book and were photographed throughout the whole of Sri Lanka, including the northern and northeastern regions of the country. Most of them are common or less common, but the Sri Lankan photographers in particular were able to find quite a few very rare plants as well, including some that are new to the flora of Sri Lanka or indeed even to science.Approximately half of the pictures were taken by the authors, the others were contributed by Sri Lankan naturalists and photographers. By publishing Volume 2 the authors wish to contribute to the spread of knowledge of Sri Lankan plants among nature lovers, students and professionals, and indirectly to the conservation of the flora of Sri Lanka. Artist/Author: Kiew, Ruth et al. Begonia is familiar as a garden plant grown for its beautiful foliage. Indeed there are few other genera that can challenge Begonia in variety of leaf shapes, colour and patterns. It often comes as a surprise to learn that the forests of Borneo are a hot spot for begonias with almost 200 named species. They grow in the deeply shaded forest understorey from the lowlands to mountain tops and on all rock types including granite, limestone, sandstone and ultramafic rocks. Readily recognised as a begonia by the very unequal sided leaf, until now it has been difficult if not impossible for naturalists to identify Bornean species. The Guide aims to overcome this and to spur interest in this fascinating genus by providing profuse illustrations, a brief description and information on distribution, habitat and uses, if any. 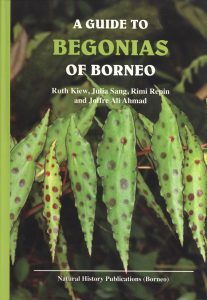 For those who wish to delve deeper, a list of all known Bornean begonias is provided together with a complete compendium of literature pertaining to Bornean begonias. Of the 194 begonias known from Borneo, 134 are illustrated here, the great majority for the first time. All Borneo’s begonias are endemic, i.e. are found nowhere else in the world, and rather few are widespread with only a handful crossing political boundaries between Brunei, Kalimantan, Sabah and Sarawak. As you will see from the begonias illustrated in the Guide, several can challenge cultivated ornamental begonias for their stunningly beautiful or striking foliage.